There’s a 1974 film called ‘The Marseilles Contract’, starring Michael Caine, Anthony Quinn and James Mason, in which the starring character, played by Caine, drives a Montreal in a daring ‘race’ with a glamorous young lady at the wheel of a yellow Porsche 911 Targa. The promotional poster promises so much: plenty of action in exotic locations, fast women – and faster cars. The problem is, the poster artwork shows a Lamborghini Miura instead of the Montreal, yet no Miura appears in the film. Clearly the artist reckoned the Lambo had better box office appeal than the Alfa. And he was probably right. Maybe it’s too sensible – too practical – to be regarded as a true exotic, but the esteem in which the Montreal is currently held within classic circles may come as something of a surprise to those unfamiliar with the model. We’ll guarantee that if you park one up anywhere – Chelsea, Monte Carlo, or Rome – you’ll return to find a group of appreciative onlookers gathered round, cooing about its shape, its rarity, its... its beauty. The story behind the Montreal is fascinating and begins in, perhaps as surprising as it is unsurprising, Montreal, Canada. Why there? Well, in 1967, the world famous Expo event came to Montreal – this was one of a series of exhibitions where countries from around the globe could show off their products and skills – and Alfa Romeo was asked to display a special car to represent the modern Italian car industry. The company could, of course, have shown off any one of its contemporary products – maybe a Giulia Sprint, or a GTA? How about the exotic Tipo 33? – but instead made the decision to build a show car. Two in fact – both were identical. Based on the chassis of the 105-series Giulia Sprint, the un-named car featured very chic lines penned by Marcello Gandini (known in later times for his work on the dramatic Lamborghini Countach) while working at Nuccio Bertone’s design studio. It was powered by the Giulia’s 1600cc four-pot, although that was almost incidental as the car was never really intended to be anything more than a stylish attention-seeker for the Italian car industry. The display car was soon referred to by public and insiders alike as the ‘Montreal’, in honour of the Expo. 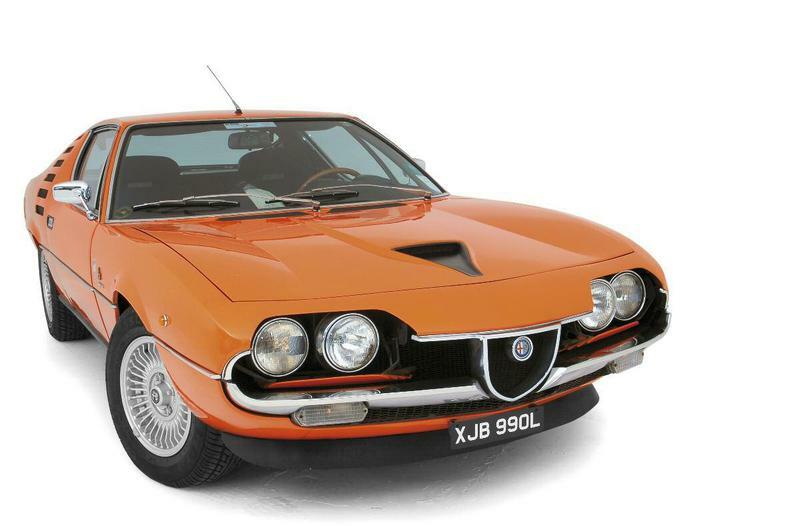 No doubt thanks to the overwhelmingly positive reception to the concept design, Alfa Romeo made the decision to develop a production version of the Montreal – well, how could Alfa choose any other name? – which was first shown at the Geneva Motor Show early in 1970. 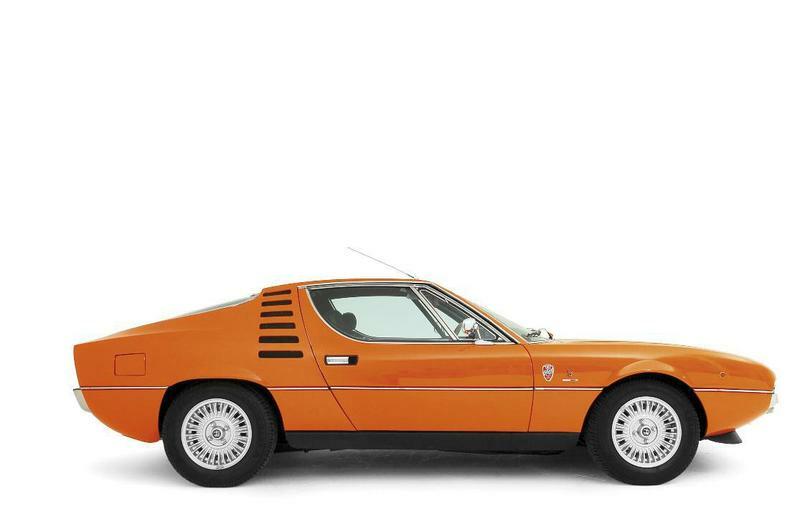 The overall styling was little altered: Gandini’s dramatic design included a row of large ‘air slots’ behind each door, which hinted at the car being mid-engined, and louvred covers over the headlights, reminiscent of Bertone’s earlier styling exercise for Porsche. The fastback styling was pure 1970s, the grill pure Alfa Romeo. But, despite those air slots, the engine remained firmly in the front. And what an engine it was. No more the Giulia-derived four-cylinder unit – in its place was a new 2593cc 90 degree V8, essentially a detuned version of the highlystrung unit found in the Alfa Tipo 33 racing car. It featured wet liners in an aluminium block, along with aluminium heads and four camshafts (two for each cylinder head) driven by chains from the end of the crankshaft. Each cylinder was served by just two valves, the exhaust valves being sodium-filled for better cooling. With a dry-sump oil system and equipped with Spica indirect mechanical fuel-injection fed by two pumps, the Montreal’s engine produced a claimed 200bhp at 6500rpm. On the whole, the engine has proved pretty reliable for what is essentially a road-going race unit. Its major shortcomings are generally reckoned to be the water pump and the injection system – some cars have been, rather lamentably, converted to carburettors. But speak with Chris Slade, the incredibly enthusiastic Montreal register secretary for the Alfa Romeo Owners’ Club, and he’ll tell you another story: “There are no major weaknesses with the engine. There’s a lot of talk about water pump failure, but whoever heard of a water pump seal lasting 40 years? What we recommend is fitting a better-quality seal and reengineering the front cover to fit a double bearing. “Regarding the Spica fuel-injection pump, most problems are caused by failure of the rubber seals, but there again, you can’t expect them to last this long without attention,” says Chris. “The pump itself doesn’t really give any problems, as long as the filter in the oil supply is changed from time to time.” Likewise the thermostatic actuators (which control the amount of fuel delivered by the pump according to engine temperature) need refurbishing periodically. All this can be done by Wes Ingram in the USA, who is recognised as being the guru on all such matters. Behind the engine sat a ZF five-speed manual allsynchromesh gearbox which then fed power to a ZF limited-slip differential set in a live-axle set-up. Yes, despite the Montreal’s exotic appearance (and heritage), the rear suspension is not fully independent consisting instead of said live axle, which is located laterally by a cast T-piece that is hung off two mountings on the body, and one on top of the differential casing. This results in a fairly high roll centre at the rear, but also gives very positive lateral location under hard cornering. The axle is further located by a pair of trailing arms, while an anti-roll bar helps reduce body roll. Springing is provided by coilover shocks. At the front, there is a double wishbone set-up, with coil springs and telescopic dampers, along with an antiroll bar. Nothing especially exotic, but it all works well. Braking is by servo-assisted ventilated discs all round, the fronts measuring 272mm in diameter, the rears 284mm. Chris Slade reckons that “In their heyday, the brakes were probably adequate but now we’re used to more modern systems with ABS they appear less so.” Alfaholics has developed a fourpot caliper brake conversion, with larger vented discs, which fits within the standard 14in wheels. Said to offer a massive increase in braking efficiency, it sells for £795 complete with all fittings. It’s generally agreed that the Montreal’s handling doesn’t quite live up to its image, but Chris Slade disputes this, too. “We suspect the standard suspension, when it was new and tight, was more than adequate – it’s when it’s worn out that you have problems!” Many owners have chosen to install a handling kit, such as that developed by Alfaholics. According to the company’s website, they cornerweighted a Montreal to find ‘surprisingly favourable weight distribution figures, dispelling the nose heavy myths!’ In order to accommodate the V8 engine, Montreals have the front chassis legs further apart compared to those of the 105-series Alfa Romeos from which they are derived. Alfaholics offers an uprated 30mm front anti-roll bar in place of the 29mm bar used on the lighter 105-series cars, and which some others suggest for use on Montreals, in order to control the body roll on corners. The kit costs £440, and includes four springs and the new anti-roll bar, with fittings. As an alternative, there is the so-called ‘Harvey Bailey’ package, available from Classic Alfa. Designed by – and hence named after – ex-Autodelta guru Rhoddy Harvey-Bailey, the kit comprises a set of four uprated (and lowered) springs, along with replacement front and rear anti-roll bars, at a price of £400, although a set of ‘yellow’ Konis adds £260 to the overall cost. One of the most striking features of the interior is the dashboard. At first glance it has the appearance of a relatively traditional two-binnacle design, but on closer inspection you realise that it’s something altogether more complex than that. Yes there are two main pods but, rather than simply housing the speedometer and tachometer, they are home to all the instrumentation, from clock to oil pressure gauge. In the centre of the car is a console which houses the radio, below which are rocker switches which operate, among other things, the wipers, high- and lowtone on the horns and power windows. Below them are the controls for the air-conditioning (if fitted – it was standard from 1972) and ventilation system. 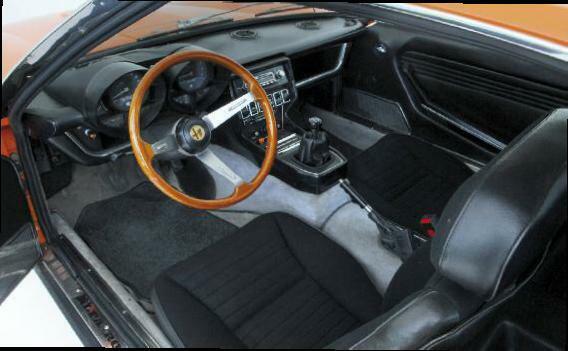 The steering wheel is fairly typical of the era, being a woodrimmed design with horn pushes set into two of the three spokes. The seats are more comfortable than supportive, with a brushed cloth facing and leatherlook sides and backs. Well, that’s not entirely true – the engine is a gem – but it’s probably true to say that most people will be tempted by the Montreal more for its styling than any other attribute. Gandini clearly knew what he was doing when he penned this pretty stunning GT – and that’s what the Montreal ultimately is: a grand tourer rather than an out and out sportscar. Out on the road, in its day the Montreal was – and still is – a fast car. Not breathtakingly fast in the way that a bigger-engined Ferrari might be, but fast enough to make it a real driver’s car. With a top speed just shy of 140mph, and a zero-to-sixty time of around 7.5 seconds, many modern hatchbacks would give a Monty a run for its money, but without the style. Handling is good, even surprisingly neutral, as long as the suspension is kept up to scratch. Montreals always used to be slated in the press for their terrible fuel economy, but that is something of an urban legend. In reality, says Chris Slade, you can expect as much as 29-30mpg, with 18mpg being an average figure about town. Far better than the 14mpg overall that some magazines claimed back in the ’70s. And this is where you’ll start to run into problems. There are no body panels available for the Montreal, and little in the way of replacement trim. 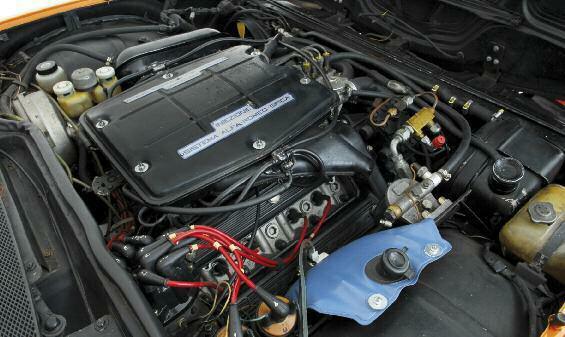 In fact, for the most part, the only readily available parts are those shared with the more popular 105-series Alfas. However, for many of the more problematic mechanical components, take a look at the Classic Alfa website, where you’ll find a surprisingly large selection of replacement parts, from clutches to bearings, cylinder liners to brake servos. No body panels, or interior trim other than a gear lever gaiter, though... You can buy a new grille surround for a cool £429 should you wish to treat your Monty. Probably the biggest problem you’ll run into is finding a good one for sale. There are ‘projects’ available for around £10,000 or less, but as Chris Slade points out, the chances are you’ll end up spending another £20,000 on top having them restored. The Montreal’s rarity is hardly surprising when you take into account the production figures. While there were 3727 left-hand drive models built between 1971 and 1977, there were just 180 right-hand drive Montreals built between 1973 and 1975. Of those, just 155 were officially imported into the UK. Ten early cars were also converted from left- to right-hand drive by Bell & Colvill in Leicester and Mario Dellioti in Birmingham. The Alfa Romeo Owners’ Club register currently has around 120 Montreals on its books and surprisingly these are fairly equally divided between left- and right-hand drive examples. There are others out there and, as Chris Slade says, “It would be in the owners’ interests to get in touch with the Register!” And that seems to be the best advice we can offer. If you’re serious about emulating Michael Caine slipsliding a Montreal on a dusty mountain road, then get in touch with the experts. You know it makes sense.